Scientists are watching ‘Oumuamua, an asteroid they think could be an alien ship. Is This Cigar-Shaped Asteroid Watching Us? Scientists are tracking it because they think that maybe—just maybe!—it might be. This artist’s impression shows the first interstellar asteroid: ‘Oumuamua. This unique object was discovered on Oct. 19 by the Pan-STARRS 1 telescope in Hawaii. Are intelligent extraterrestrials trying to communicate with or study us? Some scientists think that’s a possibility—and that it’s happening right now. Starting at 3 p.m. EST on Wednesday, researchers with the Breakthrough Listen initiative began pointing a powerful radio telescope toward a mysterious object visiting the solar system, hopeful they could detect signs that the interstellar interloper is actually of alien origin. The object in question is ‘Oumuamua, an asteroid from another star system currently zipping past Jupiter at about 196,000 miles per hour, too fast to be trapped by the sun’s gravitational pull. 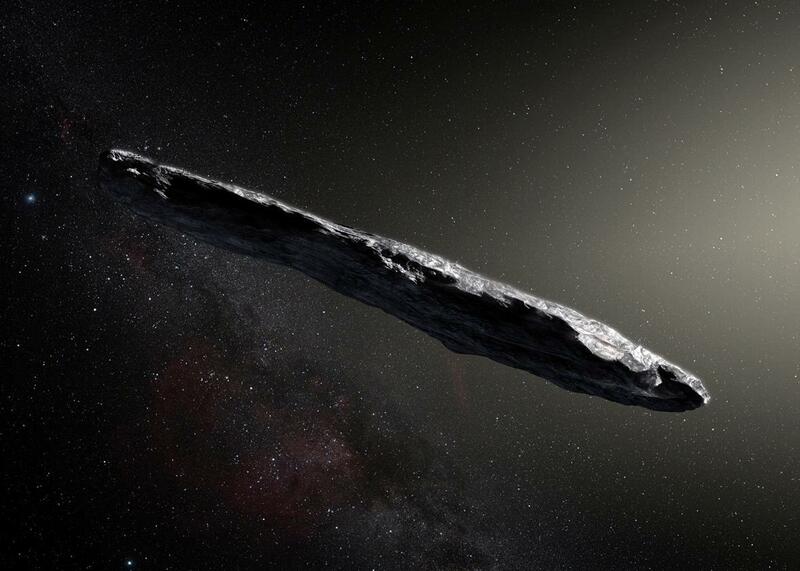 First discovered in mid-October by astronomers at the Pan-STARRS project at the University of Hawaii, the 800-meter-long, 80-meter-wide, cigar-shaped rock is, technically speaking, weird as hell—and that’s precisely why some scientists think it’s not a natural object. If you’ve spent time learning about UFOs, then you might already know that most experts who believe interstellar travel is possible posit that such a ship would probably be shaped like a cigar or needle, because it would be lean and aerodynamic enough to minimize friction and slim the chances of colliding with another object or harmful gas and dust. Especially given how solid it looks and how fast it’s going, ‘Oumuamua, which means scout or messenger in Hawaiian, is really unlike anything else. With the asteroid making a fast exit from our solar system, scientists are eager to figure out whether the bugger might actually be an alien spacecraft—maybe a vessel for living beings, maybe a robotic probe, maybe something else entirely—however unlikely that might be. Breakthrough Initiatives, launched by Russian billionaire Yuri Milner to study the galaxy for signs of extraterrestrials, is most famous for its Stephen Hawking–backed Starshot project to send cheap spacecraft to Alpha Centauri at one-fifth the speed of light to find signs of habitability or alien life. Its more conventional SETI sister project, Listen, uses radio telescopes to scan space and listen for complex radio signals that might be signs of an alien civilization. For 10 hours on Wednesday, Breakthrough Listen will point the Green Bank Telescope, based in West Virginia, at ‘Oumuamua and listen for anything unusual emanating from the object that doesn’t have a conventional explanation. The Green Bank Telescope could detect signals on the scale of a mobile phone coming from ‘Oumuamua, Milner tells Scientific American. Even if there’s no signal coming from ‘Oumuamua, the Green Bank observations can still collect valuable insight on whether the asteroid possesses water or ice or exhibits any strange chemistry. There’s no exact timetable for when Breakthrough Listen will announce its findings, but it should be sooner rather than later. It’s highly unlikely ‘Oumuamua is a sign aliens exist, but even skeptics will have to admit there’s rarely been a better object to pin our ET hopes on than this bizarre-looking rock.